Ian Donovan presented a paper at the 2016 IEEE International Conference on Systems, Man, and Cybernetics (SMC 2016) in Budapest, Hungary. Ian Donovan presented a paper entitled “MyoHMI: A Low-Cost and Flexible Platform for Developing Real-Time Human Machine Interface for Myoelectric Controlled Applications” at the 2016 IEEE International Conference on Systems, Man, and Cybernetics (SMC 2016) in Budapest, Hungary, in October 2016. This paper presents a low-cost, easy to use, and flexible platform called MyoHMI for developing real-time human machine interfaces for myoelectric controlled applications. MyoHMI facilitates the interface with a commercial EMG-based armband Myo, which costs less than $200 and can be easily worn by the user without the need of special preparation. MyoHMI also provides a highly modular and customizable C/C++ based software engine which seamlessly integrates a variety of interfacing and signal processing modules, from data acquisition through signal processing and pattern recognition, to real-time evaluation and control. 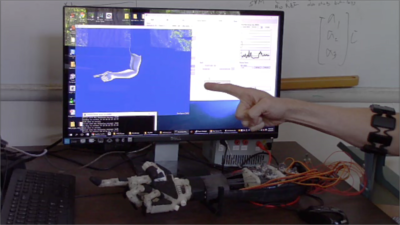 A video demonstrating our MyoHMI software controlling a virtual arm and a 3D-printed arm can be viewed here. A video demonstrating our MyoHMI software controlling a first-person shooter VR game can be viewed here. Click here to learn more details about the paper.